If you’ve been to Provinctown, you know about Captain Jack’s Wharf. It was built for fishermen to store their bait and tackle and has become an artist’s hangout ever since. Eugene O’Neill and Tennessee Williams have carried on in these parts and today Jack’s is looked after by Gregory Saint Jean, the wharf’s manager. I emailed him just a few weeks ago about renting a cottage for this week, in fact. I was just two hours away in Newport for the folk festival and dreamt about spending a week on Captain Jack’s Wharf. A dozen years or so ago, I spent a glorious few days in a newly refurbished all-white cottage, Borealis, that was small but heavenly. Alas, my schedule didn’t permit it this time and I’m back in NYC. But there, at the end of the pier is the cottage pictured, Spindrift Hesperus, some lucky devil is surrounded by water on all sides at high tide. 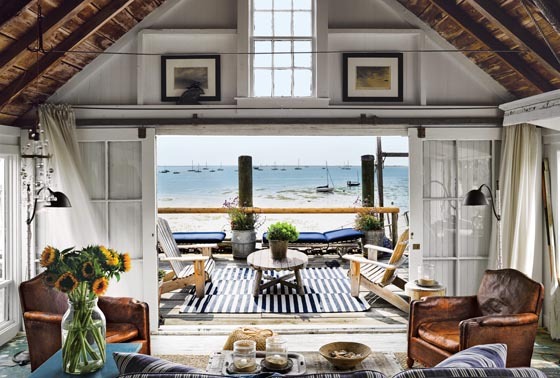 New York Magazine‘s Wendy Goodman had Douglas Friedman shoot it and to me, this is total Cape Cod perfection. Equal parts Ralph Lauren and Ralph Cramden – it’s just the right balance of funky and chic. Ah, to spend 7 days here, looking at the sea, getting in it and then still sticky from salt water having a cold beer to gaze at it some more. Check out their other cottages here and fantasize – or better yet, ACT!